Wave Accounting is the fast, easy, 100% free accounting app for small businesses. Look below to learn how to integrate your Shoeboxed account to have your receipts appear automatically in Wave Accounting. 1. Sign in to Wave Accounting and click Integrations on the left side of the page underneath settings . 2. Select Shoeboxed (located under Integrations) and click Connect. 3. You will be taken to Shoeboxed.com, where you'll need to enter your Shoeboxed username and password and select the box next to Allow Shoeboxed to transfer data to Wave Accounting. Then click Authorize App. 4. You'll be taken back to Wave to choose the business your Shoeboxed account will import into. Use the drop-down menu to make your selection. 5. Each category in Shoeboxed can be paired with a category in Wave so that each is imported into the right place. You can make your selections by matching the Shoeboxed categories on the left with your Wave Accounting Categories on the right. If you have assigned more than one category to a receipt in Shoeboxed, Wave will use alphabetical order to determine which category will go into. You also have the option of categorizing your transactions after they are imported into Wave. To do this, select the dashed line in the drop-down menu. 6. 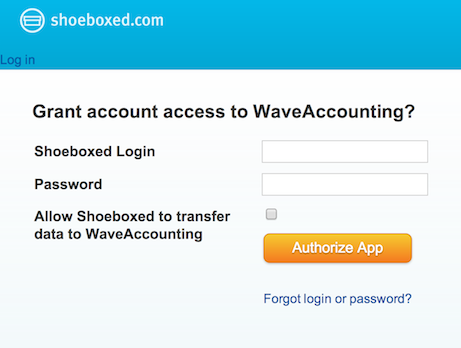 Each payment account in Shoeboxed also needs to be paired with a payment account in Wave. Make your selection by matching the Shoeboxed Payment Account with your Wave Accounting Payment Account on the right. 7. When you've mapped all of your accounts, click Save These Mappings. 8. Click on See Your Imported Transactions to continue to the Imported Transactions page. Any transactions that were categorized using the mapping process above will have an Approve button for you to click if you agree with the categorization. To change the categorization, select the transaction and click the correct Financial Category. Learn more about categorizing your transactions here. You're done! All of your data from Shoeboxed will now be imported into Wave regularly.